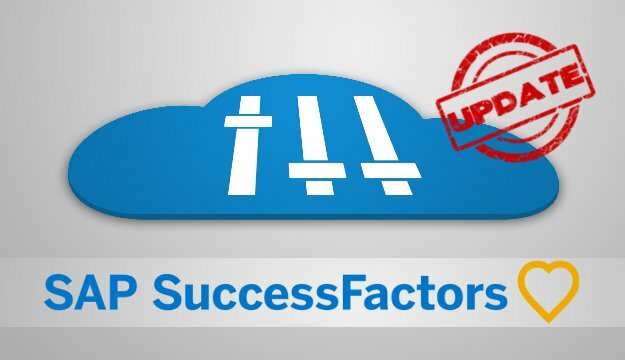 Recently I wrote two articles about SuccessFactors Release Updates. 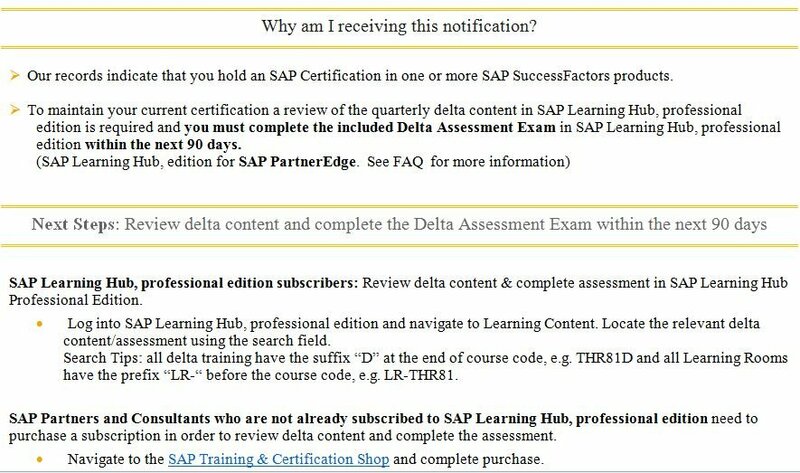 Today I want to answer some questions for our implementation Partners, because just 2 weeks ago SuccessFactors Education release some news regards the Delta Content and Exams in order to keep your Certification. Some questions are still open but I am sure this article will help you to understand the new announcement. The instructions in the E-Mail are clear. Let’s discuss the details later in this article, because first of all I want to tell you exactly how you will find the right Delta Content for you and what you need to take care of. This is a Step by Step guide so nobody gets lost on the way. If you want to skip some requirements and instructions, use the direct link to the Learning Hub. Otherwise: Every Consultant needs a SAP Learning Hub, professional edition subscribers. There is no way around this, except if you want to lose your Certification. To check if you have the professional Edition, use this link, please don’t forget to login with your correct S-User. If everything is there, lets go into the Learning Hub. Each of the Delta Content Courses contain a PDF with a summary of the most important Release Updates and a Delta Exam. Depending on the module, it will take you approximately 30-60 Minutes to review the Delta Content. The exam won’t take longer than 5-10 Minutes and contain mostly between 3-8 questions. In my personal case, I had to do 4 Courses: Foundation*, Employee Central, Recruiting Management and Workforce Analytics. * I recommend Foundation in general, and explicitly for EC Consultants, but I am not sure if it really is mandatory. So it will take around 4h every 3 months for the Delta Content + Exams only. Important: A surprising thing is that you need a pass rate 100% in your test results (Edit: In Q2 Delta Content you just need 80% correct for RCM and EC). So read the questions carefully or review the PDF again. Tips: Don’t be afraid of the Delta Content. Normally you reviewed the Release Update before or visited the Release Update Webinar anyway. It’s a great summery, really easy to review and you can repeat the Delta Exam in the Learning Hub (I am not perfect and had to repeat 2 of them). If you are afraid of exams just have the PDF open at the same time and review it together with the questions. You can print or save your Learning Hub Certification, but it is still open for me if they go automatically in the Credential Manager in order to keep Certifications up to date and visible for Customers and Partners. How will SuccessFactor freelance consultants will deal with these Delta Courses? I guess if you lose your Certificate if you don’t do the Delta Courses / Exams, but what happens to people who go on short term leave > 3 months? Do they need to do a full Certification again to get their Certification back? If you lose a Certification (and you may just own one) do you lose Provisioning access or is there any automatic mechanism to avoid that non-certified Consultants can work for customers? Well for most of the people one thing is obvious. 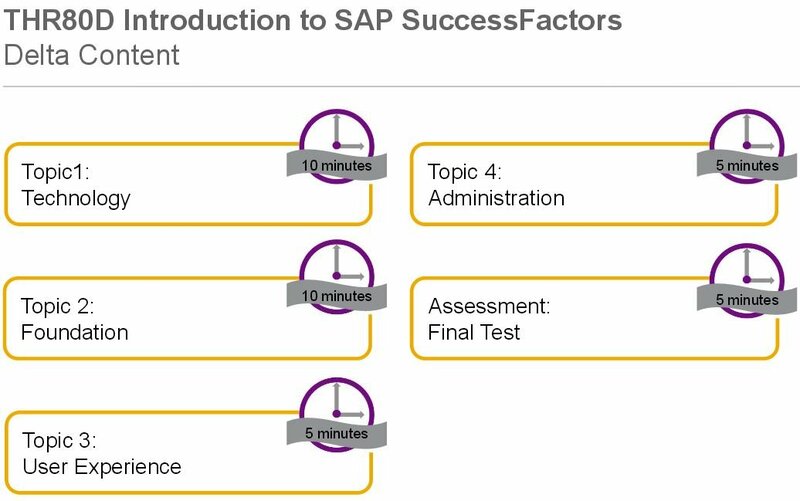 SuccessFactors Education seems to be a new income source for SAP. Every Consultant needs a Learning Hub Subscription. With the Standard Cost of 2.500 $ per year it is fairly a big amount of money that is SAP collecting from their partners. I think it’s a valid question to ask if this is fair if you consider that a company pays a Partner fee and several other things already. They want and need Partners to approach the new markets (Keyword HCP) and also the Mid Key market. With the statement of Mike Ettling, that they want to go deeper into the mid size market of 500 – 5000 employees is it smart burden them with an additional yearly fee? I don’t know, I think other influencers need to discuss. Some people already seem to be overwhelmed with this; another thing you need to keep track of. It is hard enough to follow with up the Release Updates. But didn’t Partners and Consultants complain after the first Delta Exams?! I think we got what we asked for: an up to date delta exam! Yes it is a bit of time after every Release, but in my opinion it is a valuable experience. What do you think? This article focused a lot on Delta Contents and Exams for Partners. If you want to learn more about Release Updates in general, get to know tools and amazing tips and tricks have a look at the following parts of the series. Thank u so much Chris. Good information for new certified people under single page. Very helpful. Thanks chris for sharing your experience. I have a quick question here. i currently holding my SF EC certification. According to the credential manager, course col 63 (Q3 -update was missing). However, Q4 update was available in the learning hub. Can we skip Q3 & take Q4 delta directly. the updates are not cummulative, so in Q4 you don’t learn, what you should have learned in Q3. Irrespective of whether you need it to keep your certification: if you are half serious about doing a decent job as a consultant, you should invest the 1 hour it takes to go through the documentation for EVERY quarterly update and the 5 minutes for the exam. An elaborate and useful blog. Thank you! Thank you Chris for sharing the information about Delta exams.